So, I had to see this close-up. Thank you National Gallery of Australia. Not only was I seeing a basket on top of a fashion bonnet, but a straw bonnet. I…um…..??? With previous thoughts, I would have imagined holding a basket on top of a sunbonnet or a soft bonnet such as a hood. But, a structured bonnet? A straw bonnet? What about the straw? the flowers? Squash? I must think about this. Okay, maybe the painting is showing us some damage to the bonnet – the slit on the lower edge of the tip and the maybe spot on the brim. Maybe these are just shadows. Okay, maybe this is a lower brim bonnet. Maybe she doesn’t have any flowers. Yes, it could be an older bonnet. 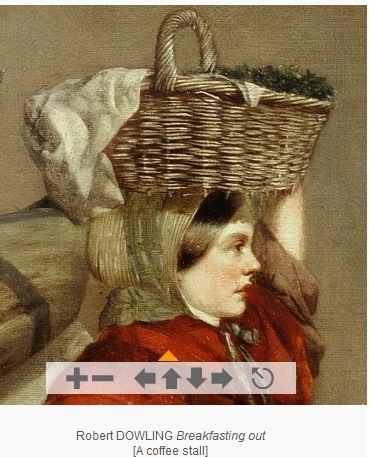 Yes, it could be her form of a working bonnet. Yes, straw held a wide range of qualities. The rest of her attire: Red plaid shawl wrapped around the shoulders and upper body. Possibly a two piece sacque & skirt combination is suggested by the fabric that falls to the hips over a different color skirt, likely wool. The bodice sleeves are rolled up, revealing a white lining. The skirt and apron appear to be pulled up in front. A hint of horizontal striping is under the lift of the skirt. This may be a work petticoat or a corded petticoat. Her boots are worn, very square in the two, with a low heel and off-center closure that I can’t quite identify as buttoning or lacing. Her stockings are light color, white and a bit slouched. 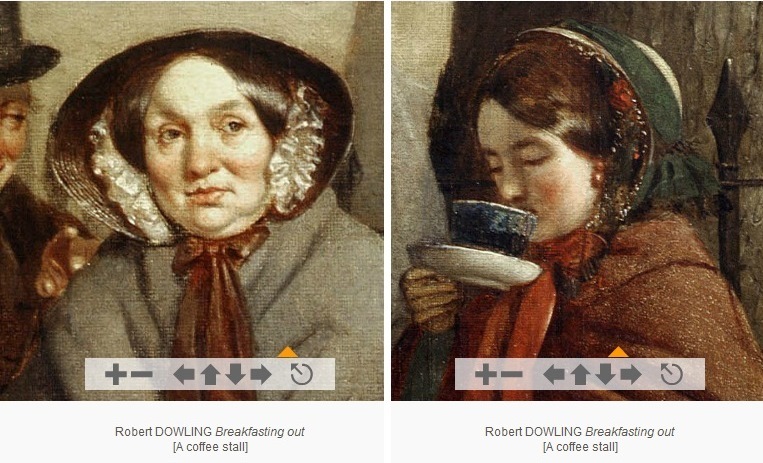 While I’m looking at this, I should also note the other two straw bonnets in the painting. The older woman is wearing a shape/style popular in the 40s with more width than height. The younger woman sipping her coffee has a smaller bonnet is a shape fashionable for the mid 50s with flowers placed primarily along the sides. She appears to either be traveling or shopping to me.